August 3, 2016 Lisa A. An El Paso rainbow. Photo from Pinterest. Hi everyone! We’re finally halfway through this week! I hope it’s going well for you! Rainbows have always been a sign of hope after a storm, both in life and weather wise for me. They are also a sign of good luck and fortune in my opinion. On my drive home from work, I saw a rainbow two days in a row. To me, it was a sign that I’ve been through so many storms but…I’ll eventually be alright time after time. It’s rare that I see a rainbow in the desert, much less two days in a row. I’m lucky if I see one once or twice a year. I tried my best to take a photo of them both days but it didn’t happen…not this time anyway! What, if anything do rainbows mean to you? The Bible has a few stories about them. I should have local art later this evening. If not, I will be back on Friday with music. Have a great day everyone! I don’t think I’d ever heard it either. Luckily, I found it on YouTube to include here. I’ve never heard that cut. Now I’m on an Ella binge. There is no voice quite like Ella’s. Thank you Erika! It was just so rare to see TWO rainbows here! I love what you connect with the two rainbows. Such a clear heavenly sign that says: All is well, no simply move on, the worst is over! I was just listening to a woman who was talking about seeing double rainbows. I’ve never seen that phenomenon myself but I can imagine that if one rainbow is beautiful then two of them together have to be awe inspiring. Although you saw two on different days, I consider that to be a good omen! I think you’re right-rainbows are a sign that everything will be alright in your life-no matter what has already happened. She definitely could, Keith! Thank you for checking it out! Gotta love Ella. She could sing a rainbow. I loved it when. 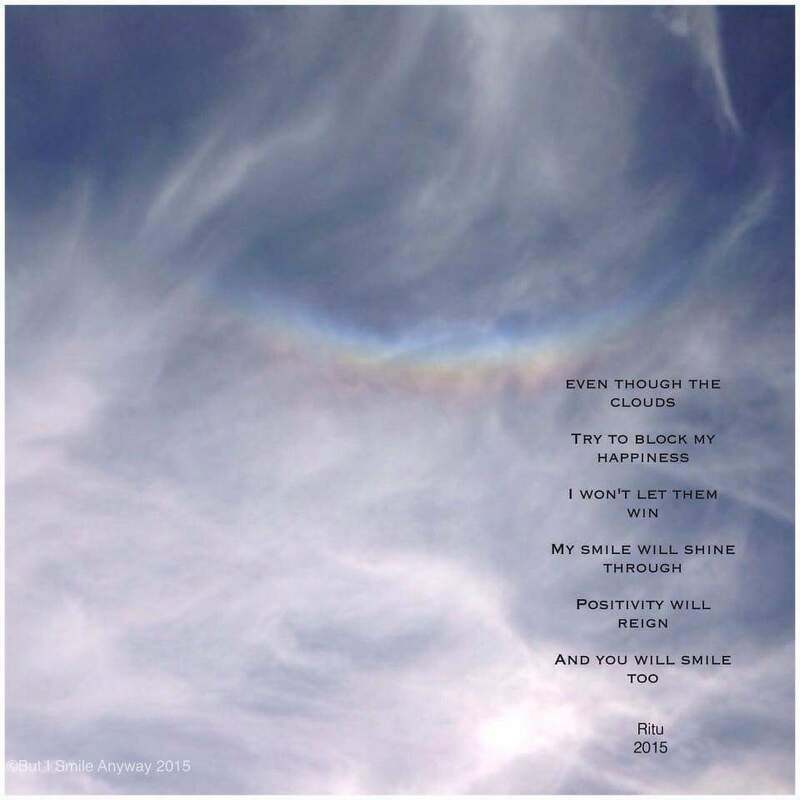 I saw an upside down rainbow… like a smile in the sky!